I eat ice cream in January, and open windows as long as it’s over 50 degrees (to the distress of The Hub, who stacks extra quilts on his side of the bed). I don’t like to fall into stereotypical ideas like frozen treats only in summer or soup in the fall. But the pull of the change in season is too strong, even for rebellious me. That’s why two pots simmered on my stove yesterday, brewing freezer-stocking batches of chicken broth. All it takes is time, which I had yesterday because I was held captive in my home while waiting for a cable TV repairman. It also requires chicken bones, which I had in the freezer from two recent roast chickens. Yes, you can freeze the carcass – seal it in a plastic bag after removing all the edible meat from it. Into each pot went one, along with a stalk of celery, a carrot, half a large onion, a couple of cloves of garlic and three or four peppercorns. I don’t add salt because I use it as a base for other foods, and I prefer to limit my salt. Water, then three or four hours on the stove at a low simmer, adding water about halfway through. Strain into containers and freeze. Sometimes there are good reasons for the way things are. And my freezer is full of them now. Some employees get bonuses, use of the company car or fruit baskets. 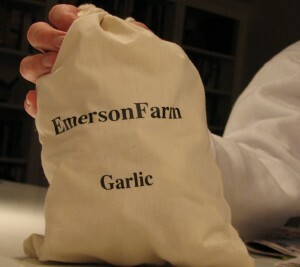 The Hub came home with this gift from his boss: Two and a half pounds of garlic, which was raised on the boss’ farm. All six people there today received a bag, so he must have had a “Twilight”-level crop. Two and a half pounds of garlic… There are at least 40 heads in this bag. I know what the trick-or-treaters coming to my house this year are getting. The Abundance Foundation in Pittsboro, N.C. is the group that sponsors the spicy Pittsboro Pepper Festival each year. The organization promotes sustainability, local food, renewable energy, stronger community – all that stuff that makes me feel like I should be wearing a tie-dyed T-shirt as I write this. But these people know food, and have been making those issues taste good for years. And that’s great by me. Their latest event is coming up on Friday evening, and you can read more about that here. What caught my eye on the menu: the Dogwood Martini. It’s a combination of vodka and – persimmons. It’s the creation of Gary Phillips, a member of the Abundance Foundation board. Phillips is also on the board of Dogwood Alliance, an Asheville, N.C.-based group that promotes sustainable forestry and highlights poor forestry practices. The Friday party is being held in conjunction with Dogwood Alliance to help the two groups work together. But here’s what you want to know – the Dogwood Martini, courtesy of Gary Phillips: Place 1 tablespoon persimmon puree (Phillips uses fruit from his yard), 2 ounces organic vodka, 1 teaspoon chopped fresh mint leaves and ice in a cocktail shaker. Shake vigorously until an ice haze permeates the shaker. Strain into a martini or sherry glass.. Top gently with 1 ounce chilled Champagne. As sure as there’ll be something deep fried on a stick at the fair, I can count on sheaves of greens in my CSA box this time of year. Kale, tatsoi, Vitamin Green mizuna, chard – a St. Patrick’s Day of color, without the beer. I like sauteed greens, but that easy fall-back can get old. Yes, you can stuff the sauteed greens in something, like ravioli or pasta shells. But, really. Instead, I tossed together a quick soup based on my memories of a kale soup. In a large pot with olive oil, I cooked a cup or so of chopped onion and a couple of cloves of garlic. Just until soft. Then, I added chicken broth and a crisper-clearing variety of greens, shredded and with tough ribs removed. About four cups’ worth. Then, I added chicken broth and chopped chicken chorizo. I like the chicken sausage because it is less greasy and doesn’t have to be cooked first. If you use pork chorizo, brown it in a separate pan first. The chorizo is plenty spicy, so all I added in the way of seasoning was salt. I covered the pot and simmered the soup gently for about an hour, until the greens were delightfully melted into the liquid. I’m sure I’ll be getting more greens today…. The slow cooker often is subjected to mediocre combinations of beef and chicken with various canned soups. But if you mix that beloved appliance with the rising popularity of meatless eating and a little creativity, you have “The Vegan Slow Cooker” by Kathy Hester (Fair Winds, $19.99). Hester, who lives in Durham, N.C. and writes a vegan slow cooker blog, starts out the book with general advice on successful slow cooking. The soup section most interested me, with recipes like Delicata Squash and Pear Soup. There are also breakfast items, side dishes, pasta, main dishes and desserts. Some recipes are labeled gluten free. You can find vegan shepherd’s pie and breakfast casseroles. (People love breakfast casseroles.) The Balsamic Brussels Sprouts would be a nice addition for Thanksgiving. If you think too much tempeh and tofu might freak out the people you’re cooking for, you could always, well, cheat. But you didn’t hear that here. I don’t compost, unless you count The Hub’s desk, and I can hardly tell a good bug from a bad one (they’re all dead bugs if they enter my house). That’s why I was a tad puzzled when I heard from the North American Association for Environmental Education via the friend of a friend. The NAAEE is holding its annual convention this week in Raleigh, N.C. I was asked me to take a small group on a field trip to the State Farmers Market and talk about how to shop from a market. That I can do. Know what’s in season and what you can expect to find. Think about your favorite ethnic flavors. Keep staples in your pantry and refrigerator. Rice can compliment a stirfry of summer vegetables, or become fried rice packed with greens or a cold rice salad with fruit. Penne pasta can become an Italian meal or spaghetti can become a cold or hot Asian noodle dish. Canned beans (black or white. Tortillas. And eggs. More people should make frittatas – you can put anything in them: artichoke hearts, fresh tomatoes, fresh herbs, green onions, peppers. It’s like an egg pizza. Soy sauce and sesame oil. Your favorite pasta sauce. Peanut butter – toss noodles and vegetables with it. Wonton wrappers can become ravioli or potstickers. Yes, ravioli. Any filling is great: cooked kale and Parmesan, cooked butternut squash and goat cheese. Just don’t over-fill – that’s the biggest mistake I made when I started making filled dumplings. A heaping teaspoon is enough. Like selecting art, let the market’s offerings draw you in. If you see it and love it, buy it. Our group went for two kinds of tomatoes, kale, red banana peppers and – because the gentleman from the West Coast requested it – okra. We turned the tomatoes, peppers, some basil from my yard, olive oil and Parmesan into a fresh pasta dish: Chopped and placed in the bottom of a dish, then hot penne poured on to wilt the vegetables. (You could add drained canned cannellini beans or cooked shrimp, too.) I was going to add the kale, too, when someone mentioned kale chips. I grabbed a baking sheet, salt, garlic powder and olive oil, and we whisked the leaves into a 350-degree oven until they were nice and crispy. The okra pods were small, so I dipped them in buttermilk and a mixture of flour and cornmeal and fried them whole. Our Californian pronounced them slime free. To me, that’s the way to cook. Even if I don’t compost my kale ribs. There are so many bad biscuits in the world. Greasy ones that leave sludgy rings on the plate. Salty ones that reek of packages and industrial mixers. Here’s a hint: Anything handed to you out a drive-through window is not going to be a good biscuit. Why do we love these little things so much that fast-food joints will try to capitalize on our affection? When made well, biscuits are simple, warm bits of cloud. Put some good ham inside them and you have perfection for breakfast. Well, that’s what I think as a Southerner. Naturally, being in Charleston, S.C., the subject of biscuits was bound to come up at the Association of Food Journalists’ recent conference. We got two views of biscuits, actually. 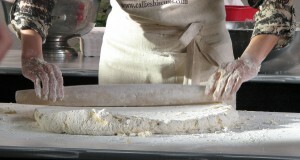 Carrie Morey, owner of Callie’s Charleston Biscuits, demonstrated biscuit-making for the group. She is one fast, biscuit-making machine, and no wonder. The company, which has been featured on the Today show, Food Network and in Martha Stewart Living, produces about 1 million biscuits a year – all by hand. Morey started with 5 pounds of self-rising flour (she prefers a lower gluten flour, such as White Lily). Into that she worked – by hand – 1 1/2 pounds of cream cheese and 1 pound of butter, both at room temperature. What? No pastry blender? No ultra-cold butter? That’s right. The secret in her technique must be how fast she works, sliding the mixture through her hands and fingers like water. “I’m looking for the feeling,” she said. “It should feel like a grated Parmesan cheese texture.” When it hit the proper texture, Morey made a well in the center of the mixture, then poured in 1/2 gallon of cold, full-fat buttermilk. Not low fat. The good stuff. She rolled the very moist dough on a floured surface to a good inch of thickness. It’s a very soft dough. Flouring the biscuit cutter helps to cut the dough quickly with a snap – no twisting, which seals the edges and prevents the biscuit from rising. In the parchment-lined baking pan, “biscuits like to touch,” Morey said, and the sides gently nudged. She bakes them at 500 degrees for 20 minutes, rotating the pan halfway through. See a slide show of Carrie Morey making biscuits here. I decided it was time to let it go, get off the bitter bus about this. But, oh, it was just the beginning. AFJ member Lee Svitak Dean of the Minneapolis Star Tribune tweeted that she knew who RuBo was and was sitting near him: Robert Sietsema of the Village Voice. By the end of the day, the news had spread to the New York Times and the Washington Post, where AFJ member Joe Yonan wrote that Dean was wrong in her estimation of the proximity of the RuBo tweets and Sietsema’s meaning they are the same person. Now, the inevitable evolution in the Twitter world: @RuthSietsema, a parody of a parody. With #AFJ you can follow it all. When I was in high school, back when we took tests with stylus and stone tablets, taking the SAT wasn’t a huge deal. Really, I remember being advised to only take it once, and study classes didn’t exist. Now, there are books of all kinds purporting to offer the secret to SAT success. But I’ve found one that, even if it doesn’t guarantee perfect scores, does ensure that the kids will learn to make dinner. “Cook Your Way Through the SAT” was created by a 14-year-old homeschooler who needed to do an art project and study for the SSAT (Secondary School Admission Test). The recipes incorporate SAT vocabulary words. And the young lady is a relaxed, accomplished cook. See her videos and find more information at her blog, SatGourmet, here. The book was released in September. Thanks to Speed Hallman at the University of North Carolina School of Journalism and Mass Communication for sending me a note about this.